Have you found that your family has been eating all the wrong food lately? Would you like to be able to provide nutritious and healthy food that is easy to prepare? You can do that now, save time, eat better and still have all the delicious taste that you want, with The 30 Day Whole Foods Slow Cooker Challenge: Delicious, Simple and Quick Whole Food Slow Cooker Recipes for Everyone. Inside the pages of this book, you will discover a new way to feed your family that is healthy and provides them with all the nutrition they need, with chapters on: An explanation of the challenge The benefits of using a slow cooker The rules of the challenge A guide to the food you can eat A selection of delicious recipes to try And more… With ideas for filling breakfasts to set you up for the day, soups and sides, main meals, vegetarian options, snacks and even a holiday dinner menu that is perfect for a little indulgence, this book will make eating healthier a joy rather than a chore. 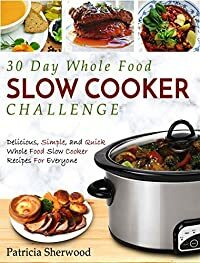 Get a copy of The 30 Day Whole Foods Slow Cooker Challenge now and change the way you eat forever!